... is the oldest of the bunch. It emulates an old SqueezeBox device. 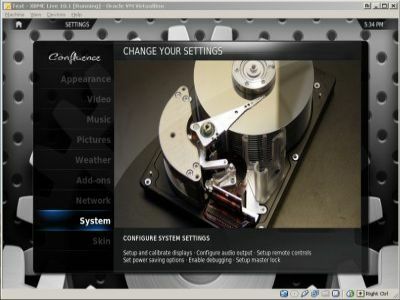 After installation you will have to set the SqueezeBox Server information in SofttSqueeze Preferences / Networking. The software may or may not autodetect your server name or IP address. Although it is supposed to be able to find your server by its 'name' it won't always do so, in which case you can try the IP address of the server. As far as I know, you cannot use SoftSqueeze to control other soft- or hardware players. SoftSqueeze is no longer supported, or updated. It still works on my Windows XP box though. SqeezeSlave is a small, console only program. It doesn't offer a fancy GUI. It's typically used on computers where you cannot or do not want to run SoftSqueeze. 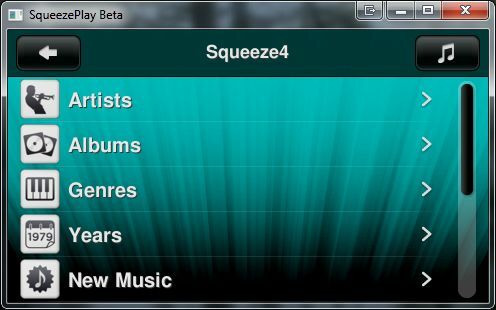 You can also use the Squeezebox Server web interface to control what SqueezeSlave is playing. To distinguish between multiple players on different machines, you can assign a name to each player using the same web interface. People running a Linux box can send output to a display board attached to their PC. No such luck for Windows users though. To remove the service, look under installed software, for any entries called 'PirmaSoft'. SqueezePlay is probably the best (software) player of them all. It's a bit harder to find (baffles me why there isn't a simple download button for it, with Logitech having abandoned SqueezeBox and all) but do a bit of googling and you'll end up with a working version. I (obviously :-)) googled for "where can I download a windows build of squeezeplay"... As a matter of convenience, I've added one copy of such a build to this website (nope, I did not build it myself): download SqueezePlay v7.8. I had some fun getting a 'cannot connect' error message, where it seemed SqueezePlay could not connect to my SqueezeBox server... it turned out my video driver had replaced the onboard audio drivers with it's own HDMI based drivers. But.. that peculiar PC was using VGA, so SqueezePlay couldn't find a working audio device and threw the misleading error 'cannot connect' etc. etc. etc. Still, there is a way to feed your Android phone with some SqueezeServer goodness, by using the same stream mentioned above. As a player I've tried MX Player, the same player I've used to stream videos to my Android phone. XBMC is an all in one app, turning your HTPC into a full featured media center. It's origins date back to a media front end for the old (hacked) X-box. It is a nice front-end, even though my first encounter with it was marred by crappy (menu) performance on an (otherwise) perfectly well working XP box. After upgrading to Windows 7 (something I'd been planning for a while now) and loading the latest 'Eden' release of XBMC it worked fine. Update 1. The problem may be related to codec inconsistencies... On some XP systems I managed to fix the problem using a newer codec pack. Not on all systems though. Update 3. XBMC is now called Kodi. Whenever you see a reference to XBMC you can read Kodi instead. XBMC/ Kodi supports DLNA / UPNP devices (TVersity) as well as regular file shares, so it will give you access to whatever you have on your network. I haven't been able to figure out the menu entries 'Movies' and 'TV Series', so I simply disabled them. You can access your regular shares and files through the menu Video anyway. Why is there no decent Jukebox function? I found listing folder contents sometimes slow, and playback not always fluid on lighter hardware / older versions of XBMC. XBMX seems to buffer properly (as opposed to VLC). VLC however seems to run better on low spec hardware. Both do fail on some DVD's, and ol' PowerDVD might still be your best friend there. If you simply want to exit XBMC by pressing the XBMC on/off button then modify the home.xml file of the skin of your choice. If you run Kodi on an Android device it will NO LONGER be able to access files on Windows 7 / Windows 10 servers. It can still access them via DLNA with TVersity, UMS or Servio. Kodi (on Android) only has the older SMB v1 protcol implemented. Because SMB v1 is insecure Microsoft has decided to take out support for this older protocol. You may be able to re-enable this as the cost of security. VLC is the player of choice on a regular PC, best of all perhaps is the lack of need for coded packs, pretty much everything essential is on-board. It doesn't feature any 'on board' navigation tools that would make it a suitable all-in-one HTPC solution. In some cases VLC can be used as the 'backend' player, with another application acting as frontend. Plays pretty much everything without the need for installing a codec pack. Doesn't buffer well. If your feed is not 100% smooth, playback may not be fluid. Where XMBC would run fine and play back some movies over wifi, without any problems, I noticed VLC to 'stutter' a little. I've not been able to find a 'buffer' option anywhere but perhaps there is one that I overlooked.